Last week, a ceremony took place at LBJ Hospital to officially open the refurbished break room in the Pediatric Ward, now a brighter, more cheerful space enlivened by art depicting well-known cartoon characters as well as miscellaneous toys and items of amusement. A longstanding project of reigning Miss American Samoa Suluga Taliau, the effort also involved art students from the American Samoa Community College (ASCC) working under professor of the Arts Regina Meredith of the Fine Arts Department. Joining Miss Taliau, Prof. Meredith and the student artists at the official opening were dignitaries First Lady Cynthia Moliga, Rev. Elder Eveni Mamoe and good lady Leumete Mamoe, Representative Mulinu'u Maluia, LBJ CEO Taufete'e John Faumuina, Rep. Dr. Annie Fuavai, Congresswoman Aumua Amata, and MASI Members Pres. Simeafou Imo, VP Igafo Maria Va'a and Moana Purcell. 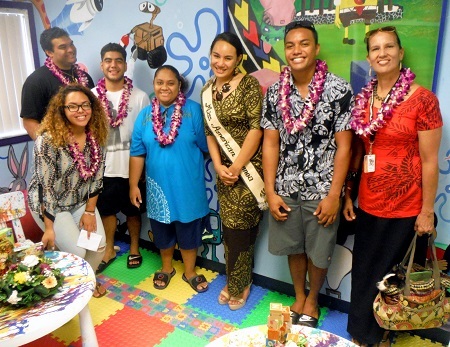 “Being Miss American Samoa involves community service projects,” explained Miss Taliau, “and I conceived of this one from having brought my younger siblings to the Pediatric Ward several times.” While the ward has long had its break room for child patients, Miss Taliau noticed the room’s need for some TLC in the form of a makeover. “I knew of playrooms in the states and how overjoyed children would feel when they would visit. To benefit the child patients at LBJ, and with the approval of LBJ CEO Taufete’e John Faumuina, I decided to make their break room my first project as Miss American Samoa. To give the room an uplifting visual aspect, Miss Taliau, herself an ASCC student, sought the help of Prof. Meredith, who in turn organized students from this semester’s Painting (ART 172) class, along with several previous class members, to contribute their talents. "When Suluga approached me about her project, I said yes immediately,” recalled Prof. Meredith, “first, because she is a full-time ASCC student, and also because it enables Art students to experience firsthand what a collaborative project feels like, with creative input, work ethics, and a deadline to meet. Plus it is so rewarding to surround oneself with that artistic energy." Under Prof. Meredith’s guidance, ASCC student artists Hillary Purcell, Loimata Siona, Tanu Luani, Warren King, Pua Tofaeono, and Aidan King worked during regularly scheduled meetings and on their own time for three weeks, resulting in the break room’s transformation from a bland space into one rich in expertly-rendered images of well-known cartoon characters. While the Pediatric Ward beak room may be “up and running” now, Miss Taliau anticipates that the project will require ongoing attention. “We will still seek donations of toys as well as resources for the occasional repairs and additional furniture,” she explained. Anyone wishing to donate to the LBJ Pediatric Ward playroom can contact Miss Taliau through the American Samoa Visitors Bureau at 699-9805.